There's nothing like waking up in the morning, glancing outside, and seeing the sun glistening off the water, Sometimes even a Dolphin Pod. It's one of the best ways to start the day, and at this Carlsbad vacation rental, you can do just that. It's not just about providing you with a temporary place to stay. We aim to give you a home-away-from-home that is as beautiful and stylish as it is comfortable and welcoming. This 2-bedroom, 2-bathroom home sleeps 5 (A roll away bed is available), and each bedroom features a plush king-size bed as well as a flat screen TV. Whole House Central Air Conditioning, The open layout of the home allows for ample space for easy interaction among guests, and whether you're in the living room, dining area, or kitchen, you'll have ocean views. Want to take the gathering outside? Feel free to enjoy the patio. It features a BBQ, a fire pit table, and seating with additional chairs on the porch. It's an ideal space to sit and relax while you listen to the ocean waves and take in the wonderful views. Should you need to do laundry, we have you covered with a washer and dryer ready for you to use on the premises. As fabulous as the home is, we have no doubt you're going to want to get out and explore the gorgeous Carlsbad area. Although the ocean is right across the street and the beach is a short two-minute walk from your front door, there is even more to discover in this city. For starters, whether you're looking for phenomenal seafood, a great cup of coffee, a really good burger, or an entirely different delicious dish, you have your pick from one of the many restaurants that are within a 10-minute walk or drive away. If you're up for taking a drive, within about an hour away, you'll find Disneyland, Knott's Berry Farm, San Diego Zoo Safari Park, SeaWorld, LEGOLAND, The Flower Fields, many parks, and more. Get ready to do some serious shopping because the Carlsbad Premium Outlets require only a 7-minute drive. We'd be remiss if we didn't mention the golf and fishing as there are quite a few places to do a little of each near the vacation home and in the surrounding areas. Don't worry about parking! there is plenty of street parking. If you want to leave the car behind and you're looking for alternative ways to get around the pedestrian-friendly Carlsbad, public transportation is easily accessible and bike rentals are available in the city. Flying in? 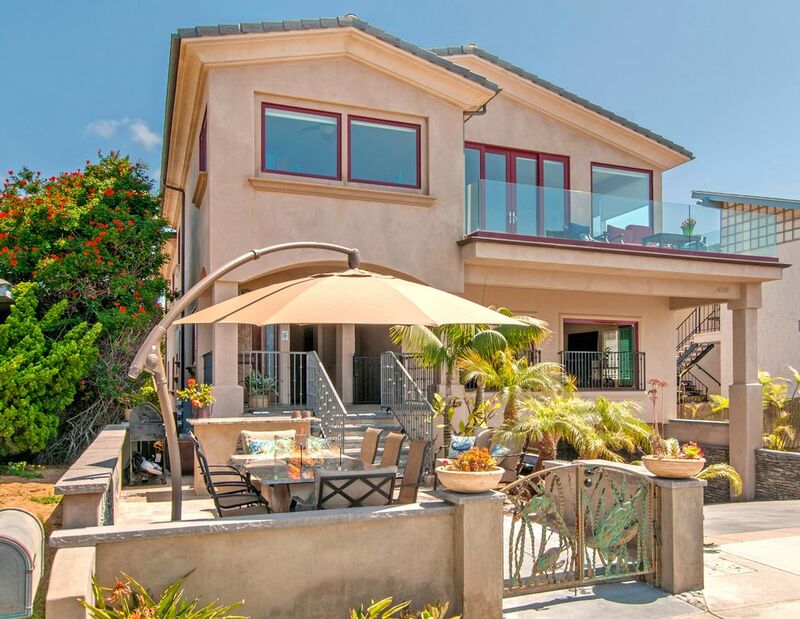 The McClellan-Palomar Airport is about 15-minutes away.We want you to come to this Carlsbad home and feel like this is the oasis you've been desiring for quite some time, a break from the daily hustle-and-bustle. Should you have any questions, feel free to reach out. We can't wait to hear from you! Live and work in Carlsbad since 1976. Real Estate Industry is my passion. Steps to the beach, Without the beach Traffic Drama! Parking is never a problem. Stocked with everything you need for a great vacation. Thank You for choosing my property for your vacation. It was a pleasure to have you as my guests. This rental was a great location with ocean views right from the living area. The place was clean and well equipped for all your needs. We would definitely stay again here while visiting surrounding areas. We loved Carlsbad with tons to do. Many options to eat and shop in the village! We had a terrific time. This first floor unit is beautiful, with terrific views of the ocean, along the lagoon with walking trails out the front door. It is a pleasant mile walk from downtown Carlsbad. The beds are extremely comfortable, nice bathrooms, furniture new and clean, well stocked kitchen with everything we needed for lovely meals. If we return, we'll be on the site promptly to book here again. The owner is friendly, professional and available to guests. Thank You for your kind words. It was a pleasure having you at the property. Fantastic Thanksgiving week at the Beach!! Perfect location. Great views. Bill the owner is a pleasure to work with. Townhouse was clean and well stocked. We would repeat. Our family of 5 had the most amazing week here. Bill went above and beyond to accommodate us with recommendations and providing everything we needed to have an amazing week. He even had AC units in the bedrooms to make sure we were comfortable. The view is so relaxing to wake up to each morning and relax all day long. We had a hard time getting the kids out of the house they just wanted to relax all day. The beach is so easy to get to and our kids ages 4-10 all enjoyed playing in the water and sand. Bill had everything we needed for the beach towels, boogie boards, chairs, umbrellas, sand toys, and an ice chest. The rooms had great storage and the house is so clean!. We can not say enough great things about our stay. We will definitely be returning the next time we are in Carlsbad. Thank you Bill for an amazing vacation! Thank You for choosing my property. It was a pleasure to host you and your family. Your all welcome. The whole family gets a 5 star rating. Again, Thank you. we thoroughly enjoyed our stay in this lovely home. The views of the ocean were beautiful and location ideal for strolling along the ocean or walking into the village for dinner, ice cream or shopping. Thank You Renee. It was a pleasure to have you. You and the family are 5 star guests. Your welcome anytime.